We have signed an agreement with Flarm that will enable our customers using a SkyEcho 2 ADSB device to receive Flarm signals directly from broadcasting aircraft. As many of you will know, Flarm devices are fairly expensive and for some GA aircraft may be prohibitively so, or just one device too many in the cockpit. However, with a good proportion of the glider fleet throughout Europe emitting Flarm signals, we want to be able to receive these signals and avoid getting too close to one. Our agreement means that the SkyEcho 2 can receive the Flarm signals and pass them to SkyDemon in their raw form. We then decode them and feed the telemetry from the Flarm aircraft into our normal collision avoidance algorithms. As the pilot, you won’t need to know or care whether it’s an ADSB or a Flarm signal that has been received; you’ll be warned about any conflict regardless. Affordability was one of our main concerns when thinking about this partnership and it’ll cost our customers around £30 a year inc VAT to add the decoding ability to their subscription. Obviously, most of this goes to Flarm for licensing the functionality to us. uAvionix have already started shipping the SkyEcho 2. Shipping devices will start carrying the Flarm capability within a few weeks and already shipped devices can be firmware upgraded at no cost. The next version of SkyDemon will contain the Flarm decoding ability. For clarity is this £30 extra across all your subscribers to spread the cost or just for subscribers who actually have a Sky Echo? edited to add, my only concern is that it 'legitimises" the idea that flight safety data can be proprietary. Commercially, this can only be good for Flarm, uAvionix and SkyDemon. If only we could transmit ADSB out with transponder mode S switched on. When will the never ending trial finish I wonder. Tim Dawson wrote: ...it’ll cost our customers around £30 a year inc VAT to add the decoding ability to their subscription. FLARM data has always been proprietary; this doesn't change that but does provide an alternative affordable route to getting it. Dave W wrote: FLARM data has always been proprietary; this doesn't change that but does provide an alternative affordable route to getting it. Absolutely, but whether that situation is right when an open standard exists, but is not adopted is another question. FAOD, this is a fabulous initiative given the situation that we're in. So, if I want to see gliders with a SE2, I HAVE to use SkyDemon? That sounds like a very backward step for SE2 ? What happened to them supporting other apps and even the free ones. Certain supporters who I’ll not name have gone on and on and on and on about how the SE2 is subscription free and that’s one of it’s major plus points. £119 PER YEAR if you want to see gliders sounds a bit ridiculous to me. And to think I was going to buy an SE2 when they start shipping the pre orders. It’ll cost me &400 up front followed by £119 a year ? That’s a bit of a baffling summary. £89 of the £119 is for all the other flying and planning benefits os SD. The £30 goes mostly to Flarm. It’s hardly the fault of Uavionics or SD. The four hundred odd quid gives you ADSB. These are all separate benefits. Doesn't that just make you realise what a terrific initiative and leap towards GA safety , the development and affordable availability of PAW/ OGN really is? No I don't have one or need one, not being a qualified Pilot and all that, but as an "outsider" if I can see what a terrific bit of kit it is, why don't others? To be clear - uAvionix makes this interface available to all EFBs, they just need to each negotiate the license deal with FLARM. uAvionix is charging $0 additional to FLARM, SkyDemon, end users, or any other EFB for this functionality. For the convenience of not having to manage the yearly FLARM mandatory updates, we've passed on any benefit to SkyDemon and others. No, I’m comparing it to the other traffic that SE2 passes, you can use any of the Nav packages to see it, or even the standalone “radar”. Forget PAW for a minute. 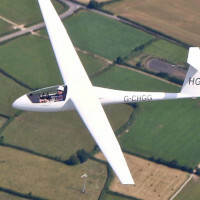 I’m saying if I want to see gliders, it’s £119 a year. As I HAVE to use SD to see gliders. Couldn’t the £30 have been charged by SE2, then at least there’s an affordable option. This sounds a very sensible approach, and I suspect will be on my shopping list as soon as the issue around using SE2 and mode-S transponder concurrently has been resolved. Thanks for sorting this out Tim and UAvionix! If you want to see Flarm traffic with SkyEcho2, it is £119/y. But if you don't like this setup, you're free to use other solution.